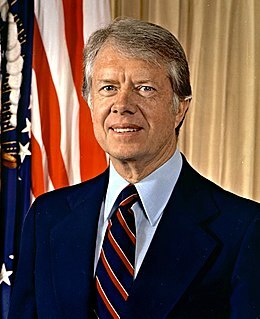 Executive Order 12170 was issued by American president Jimmy Carter on November 14, 1979, ten days after the Iran hostage crisis had started. This Executive Order, empowered under the International Emergency Economic Powers Act, called for the freezing of all Iranian government assets held within the United States. The Iran hostage crisis was a diplomatic standoff between the United States and Iran. Fifty-two American diplomats and citizens were held hostage for 444 days from November 4, 1979, to January 20, 1981, after a group of Iranian college students belonging to the Muslim Student Followers of the Imam's Line, who supported the Iranian Revolution, took over the U.S. Embassy in Tehran. It stands as the longest hostage crisis in recorded history. 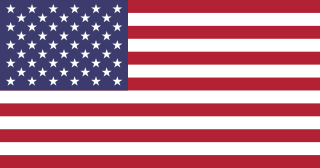 The release of the US hostages, as well as the unfreezing of Iranian assets and establishing arbitration for resolving claims on both sides was negotiated in the Algiers Accords; the accords were signed on the last full day of the Carter administration and assented to by the incoming Reagan Administration. The Algeria Declaration was a set of agreements between the United States and Iran to resolve the Iran hostage crisis, brokered by the Algerian government and signed in Algiers on January 19, 1981. The crisis arose from the takeover of the American embassy in Tehran on November 4, 1979, and the taking hostage of the American staff there. By this accord the 52 American citizens were set free and able to leave Iran. The presidency of Ronald Reagan began on January 20, 1981, when Ronald Reagan was inaugurated as the 40th President of the United States, and ended on January 20, 1989. 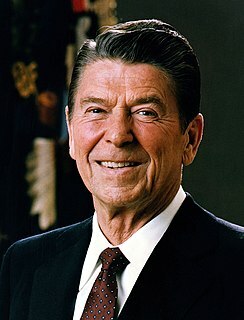 Reagan, a Republican, took office following a landslide victory over Democratic incumbent President Jimmy Carter in the 1980 presidential election. Reagan was succeeded by his Vice President, George H. W. Bush, who won the 1988 presidential election with Reagan's support. Reagan's 1980 election resulted from a dramatic conservative shift to the right in American politics, including a loss of confidence in liberal, New Deal, and Great Society programs and priorities that had dominated the national agenda since the 1930s. Dames & Moore v. Regan, 453 U.S. 654 (1981), was a United States Supreme Court case dealing with President Jimmy Carter's Executive Order 12170, which froze Iranian assets in the United States on November 14, 1979 in response to the Iran hostage crisis, which began on November 4, 1979. The Office of Foreign Assets Control (OFAC) is a financial intelligence and enforcement agency of the U.S. Treasury Department. It administers and enforces economic and trade sanctions in support of U.S. national security and foreign policy objectives. Under Presidential national emergency powers, OFAC carries out its activities against foreign states as well as a variety of other organizations and individuals, like terrorist groups, deemed to be a threat to U.S. national security. Iran and the United States have had no formal diplomatic relations since 1980. Pakistan serves as Iran's protecting power in the United States, while Switzerland serves as America's protecting power in Iran. Contacts are carried out through the Iranian Interests Section of the Pakistani Embassy in Washington, D.C., and the US Interests Section of the Swiss Embassy in Tehran. Iranian Supreme Leader Ali Khamenei banned direct talks with the United States in 2018. Economic sanctions are commercial and financial penalties applied by one or more countries against a targeted self-governing state, group, or individual. Economic sanctions may include various forms of trade barriers, tariffs, and restrictions on financial transactions. An embargo is similar, but usually implies a more severe sanction. 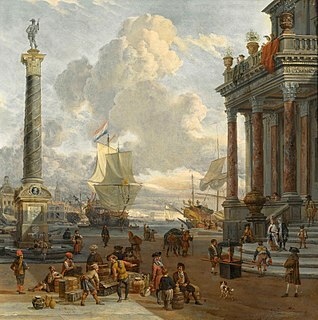 Economic sanctions generally aim to change the behavior of elites in the target country. However, the efficacy of sanctions is debatable and sanctions can have unintended consequences. Economic sanctions are not necessarily imposed because of economic circumstances—they may also be imposed for a variety of political, military, and social issues. Economic sanctions can be used for achieving domestic and international purposes. Executive Order 13224 is an executive order issued by U.S. President George W. Bush on September 23, 2001, as a response to the attacks on September 11, 2001. It has been renewed every year since. 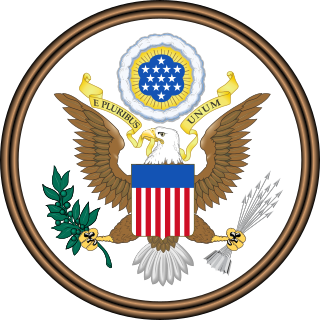 The International Emergency Economic Powers Act (IEEPA), Title II of Pub.L. 95–223, 91 Stat. 1626, enacted October 28, 1977, is a United States federal law authorizing the President to regulate commerce after declaring a national emergency in response to any unusual and extraordinary threat to the United States which has a foreign source. The National Emergencies Act (NEA) is a United States federal law passed to end all previous national emergencies and to formalize the emergency powers of the President. Executive Order 13438, titled Blocking Property of Certain Persons Who Threaten Stabilization Efforts in Iraq, was an executive order signed by President George W. Bush on July 17, 2007. Its stated attempt is to reduce the flow of material support for insurgents and terrorists in the Iraq War. The Iran and Libya Sanctions Act of 1996 (ILSA) was a 1996 act of the United States Congress that imposed economic sanctions on firms doing business with Iran and Libya. On September 20, 2004, the President signed an Executive Order to terminate the national emergency with respect to Libya and to end IEEPA-based economic sanctions on Libya. On September 30, 2006, the Act was renamed the Iran Sanctions Act (ISA). The Act was originally limited to five years, and has been extended several times. On December 1, 2016, ISA was extended for a further ten years. A presidential memorandum is a type of directive issued by the President of the United States to manage and govern the actions, practices, and policies of the various departments and agencies found under the executive branch of the United States government. It has the force of law and is usually used to delegate tasks, direct specific government agencies to do something, or to start a regulatory process. There are three types of presidential memoranda: presidential determination or presidential finding, memorandum of disapproval, and hortatory memorandum. The following is a timeline of the presidency of Barack Obama, from January 1, 2014 to December 31, 2014. 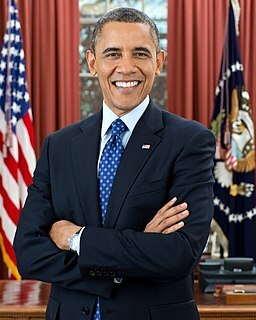 For his time as President-elect, see the Presidential transition of Barack Obama; for a detailed account of his first months in office, see First 100 days of Barack Obama's presidency; and for a complete itinerary of his travels, see List of presidential trips made by Barack Obama. The Joint Comprehensive Plan of Action, known commonly as the Iran nuclear deal or Iran deal, is an agreement on the Iranian nuclear program reached in Vienna on 14 July 2015 between Iran, the P5+1, and the European Union. The following is a timeline of the presidency of Barack Obama, from January 1, 2015 to December 31, 2015. For his time as President-elect, see the Presidential transition of Barack Obama; for a detailed account of his first months in office, see First 100 days of Barack Obama's presidency; and for a complete itinerary of his travels, see List of presidential trips made by Barack Obama. The following is a timeline of the presidency of Barack Obama, from January 1, 2016 to December 31, 2016. For his time as President-elect, see the Presidential transition of Barack Obama; for a detailed account of his first months in office, see First 100 days of Barack Obama's presidency; and for a complete itinerary of his travels, see List of presidential trips made by Barack Obama. Barack Obama's farewell address was the final public speech of Barack Obama as the 44th President of the United States, delivered on January 10, 2017 at 9:00 p.m. EST. The farewell address was broadcast on various television and radio stations and livestreamed online by the White House. An estimated 24 million people watched the address live on television. The speech and its transcript are available on the archived version of the Obama Whitehouse website.